Pondering the depths of guilt and despair, the criminal is led to the scene of a crime. His handlers are not brutal, they too are subdued; as if ashamed themselves, and feeling the general shame of a greedy act. Well, it was a robbery — which is wrong — but it was not murder or assault or physically violent. It was an intellectual job, a computerized heist, involving hackers and exploits that emptied the contents of ATM machines into the hands of a well-organized gang. The thieves, apparently, had been active for some time. Wreaking their computerized havoc on the banks of Europe and America almost with impunity, they suddenly fell into a trap on the yam-shaped island. And now, one of the ring-leaders, being led in handcuffs and muddy slippers down the rain-streaked hillside, bows his head. He looks penitent. He had asked his captors if there was a possibility of the death penalty. His white plastic rain poncho is framed by the dripping yellow ponchos of the unarmed policemen, as they try not to slip on the steep muddy path. Somewhere along the trail, a filthy old duffel bag, bursting with stacks of 100 NT$ bills, awaited them. This scene, at once so droll and unrehearsed, captured in the midst of the investigation process, has a strangely beautiful, glowing, transcendence to it. 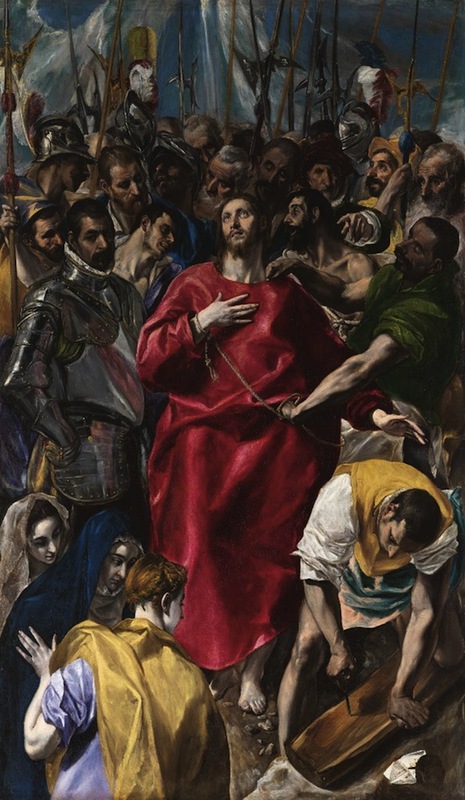 For some reason, when I saw the form of the suspect, hands bound, his long sinewy body twisting slightly and lost in deep meditation on his own sins, I suddenly thought of the paintings of El Greco. Those giant lush canvases, full of figures interacting in various angular poses, which decompose into brightly contrasting zones of color, are imbued with El Greco’s heavy Catholocism, and scenes of melancholy; like The Disrobing of Christ. What an odd thought, really. It is not that I sympathize with the criminal so much as respect the care and sense of calm which the police have in dealing with the matter. All of this captured in the lens and splashed in a vertical composition of slow and moody actions built out of rich flat color shapes. This is a great photo. If nothing else, it brings me to the rainy and muddy steps in the forest where the bag of money was dumped. It puts me exactly into the scene, and into the mood. How will it end? In some sordid courtroom anti-climax. Sure. Doesn’t it always?